This neighbourhood includes the villages of Richmond and Munster and the communities of Dwyer Hill and Twin Elms. The village of Richmond was settled by United Loyalists after the War of 1812, was founded in 1818, and spans the Jock River, a tributary of the Rideau River. A military post for some years, the village derives its name from the Duke of Richmond, then Governor General of Canada, who is reputed to have died here in 1819 from the bite of a pet fox in a frame barn on Chapman’s farm, about 2 miles from the village, on the Goodwood River (now, the Jock River). Richmond was incorporated as a village on the Goodwood River in the east corner of the township of Goulbourne, 21 miles from Ottawa City and 11 miles from the Ottawa river in 1850. For a number of years trade and business was very active, but by 1860s appears to have declined. 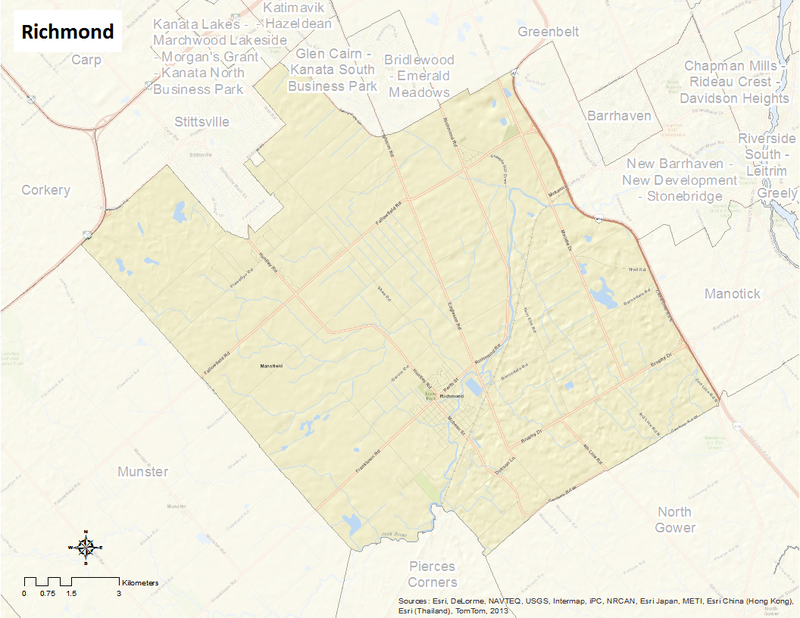 It was annexed by Goulbourn Township in 1974. In 1969, Richmond became part of Regional Municipality of Ottawa-Carleton and in 2001 was recognized as one of the rural villages within the amalgamated City of Ottawa. The village of Munster is named after the province of Munster, in Ireland and was home to the Anglican parish church of St. Stephens, which closed in the 1960s. At that time, Munster was a simple cross-roads village of a handful of houses, but in the 1970s a rural suburb, marketed as “Munster Hamlet”, added about 400 houses to the community. The community was built in four quadrants. The church was then re-opened as the Munster branch of the Ottawa Public Library. Munster has a restaurant, United Church, Loyal Orange Lodge # 917 (warrant issued in 1875) and is the site of Saunders Farm, which has outdoor mazes and a Halloween theme park.